“Dyspeptic, Fanatic, Stoneheart, Monomaniac” Are Other Terms in “Final” Retort. 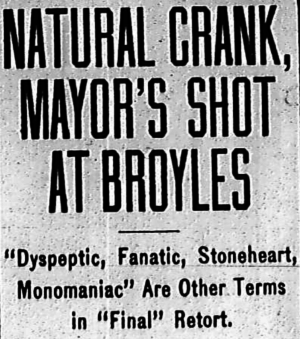 Mayor Woodward again went over the head of Recorder Broyles Friday when he reduced the sentence of George Poulos, a restaurant keeper on Alabama street, who had been fined $100 and sentenced to 30 days in the Stockade fo [sic] violating the prohibition law. The Mayor said he was much surprised that the Recorder did not make the fine $49 and the sentence 29 days so as to stay outside the jurisdiction of the Mayor. It was expected that Mayor Woodward would issue a full pardon but he didn’t. He just reduced the fine to $49 and the sentence to 29 days.